NEW YORK It's a dramatic case built on amateur video that went viral - footage of motorcycles swarming around an SUV on a highway, the driver plowing over a biker to escape and a high-speed chase that ends with the driver pulled out and beaten in front of his family. But as compelling as the footage is, it doesn't answer a key question: What happened before the cameras were turned on? 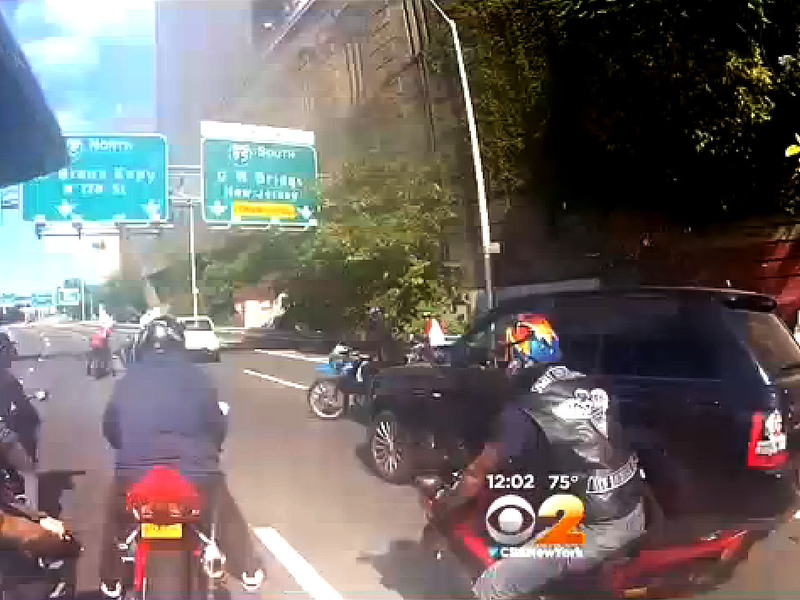 Nearly two weeks later, some bikers are suggesting SUV driver Alexian Lien, knowingly or not, instigated the confrontation off-camera earlier by clipping one of the bikes in a rally on the Henry Hudson Parkway in Manhattan. Authorities are looking into everything that unfolded along the ride's path from lower to upper Manhattan, including a possibility that a motorcyclist hit the SUV, not the other way around, and broke its side mirror before the encounters on the video, said a law enforcement official, who hadn't been authorized to discuss the inquiry and spoke to The Associated Press on the condition of anonymity. Investigators are looking for other helmet-camera videos of the ride, which spurred 911 calls about the bikers' behavior before the SUV driver's beating. Attorney Gloria Allred, representing Edwin Mieses Jr., the biker who was crushed, claims Lien bumped another motorcycle while changing lanes on the highway 2 to 3 miles before his SUV knocked intobiker Christopher Cruz. "We have evidence that he hit that (first) bike and didn't stop," Allred said by phone. Mieses, of Lawrence, Mass., didn't see any earlier encounter but got off his motorcycle to defuse the tense situation and was headed back when he was hit from behind by the SUV, she said. He broke his legs and suffered a spine injury and likely is paralyzed, his family has said. Allred declined to say what other witnesses had contacted her, but another biker who participated in the rally, Louis Castaldo, gave a similar account in an interview on Fox 5 News. Castaldo said that when bikers tried to approach Lien's Range Rover, Lien "decides to run over three or four people. ... He should have just apologized." Images made public have painted a narrative that begins with Cruz, of Passaic, N.J., pulling in front of the black Range Rover and decelerating to the point where the vehicle bumps his back tire. Cruz, since his arrest on reckless endangerment and other charges, has insisted he looked over at the driver only to change lanes and didn't deliberately slow down. He didn't see any prior interaction that may have happened between the SUV and the motorcyclists, said his attorney, H. Benjamin Perez. Cruz waited on the highway for police when other riders chased after Lien, Perez said. "He's treated as though he orchestrated this entire event," Perez said. "It's crazy." Authorities have used the video footage to bring charges against Cruz and six other motorcyclists, including an off-duty undercover police detective. Prosecutors said the detective, Wojciech Braszczok, lied when he said he didn't witness the assault. Video has surfaced showing him punching out the back window, they said. His lawyer says he'll be exonerated. On Thursday, prosecutors said the latest biker arrested, James Kuehne, had used his helmet to bash Lien as he lay on the ground. Kuehne was released on $200,000 bond after his arraignment on gang assault and other charges. He hasn't entered a plea. Lien hasn't been charged with a crime and hasn't spoken publicly about the case. His wife, who was in the SUV with him and their 2-year-old child, hasblamed the bikers for putting the family in "grave danger."